Kamailio SIP Server v5.0.4 stable is out – a minor release including fixes in code and documentation since v5.0.3. The configuration file and database schema compatibility is preserved, which means you don’t have to change anything to update. Kamailio v5.0.4 is based on the latest version of GIT branch 5.0. We recommend those running previous 5.0.x or older versions to upgrade. There is no change that has to be done to configuration file or database structure comparing with the previous release of the v5.0 branch. The 2017 edition of AstriCon was very intense, or at least it was for me (Daniel-Constantin Mierla, Asipto) and the Kamailio presence at the event. Three days without any time to rest! Before summarising the event from personal perspective, I want to give credits to the people that helped at Kamailio booth and around. Big thanks to Fred Posner (The Palner Group, LOD), he did the heavy lifting on all booth logistics, from preparing required things in advance, setting up the space, banners and rollups, stickers, a.s.o. Of course, Yeni from DreamDayCakes baked again the famous Kamailio and Asterisk cookies, very delicious bits that people could taste at our booth. Carsten Bock from NG-Voice was there with his Kamailio-VoLTE demos and devices. Torrey Searle’s giveaways from Voxbone were very popular again. Alex Balashov from Evariste Systems ensured that anyone in doubt understands properly the role of Kamailio in a VoIP network and the benefits of using it along with PBX systems. Joran Vinzens from Sipgate completed our team, being around as we needed. There were four presentations by the people at the booth — I, Carsten, Fred and Joran had talks on Wednesday or Thursday. On Tuesday, I, Fred and Torrey participated to AstriDevCon, as always a very good full day session with technical debates, with Mathew Friedrikson and Matt Jordan coordinating and talking about what’s expected next in Asterisk. Close to the end of the event on Thursday, it was the open source project management panel, with me among the panelists. Being completely warmed up and with some pressure from James Body, I also did the Dangerous Demos, where the Ubuntu Phone decided to reboot as I was on stage, leading me towards the Riskiest Demo Prize (aka Crash & Burn). Carsten and Torrey did dangerous demos as well, with Carsten being the runner up on one of the tracks, which secured him a nice prize as well. I expect that recordings of the sessions will become available in the near future from the organizers of Astricon. Definitely it was one of the best AstriCon ever, credits to Digium and the organizing team! 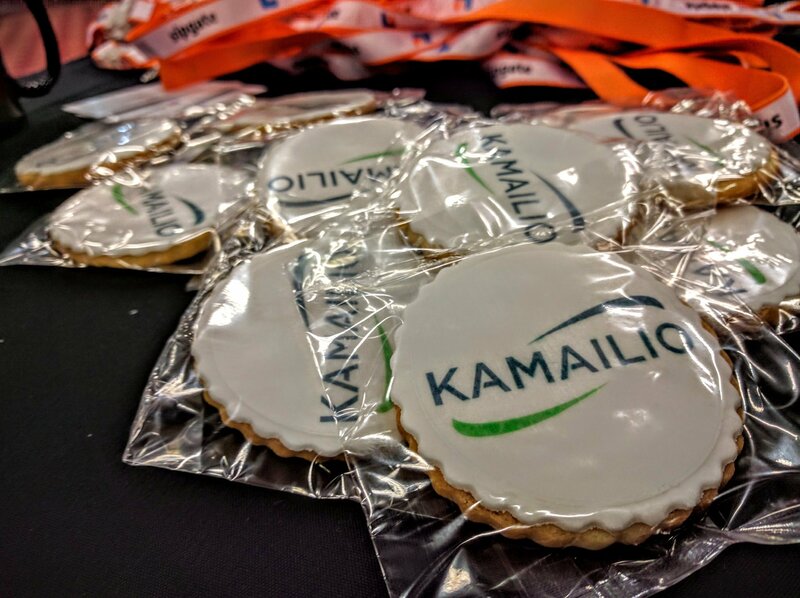 Kamailio had a great time there, see you at the next editions! A short note to mark the freezing of development for Kamailio v5.1 series. For few weeks, no new features will be pushed in the master branch. Once the branch 5.1 is created (expected to happen in 3-4 weeks from now), the master branch becomes again open for new feature. Meanwhile the focus is going to be on testing current code. Work on related tools (e.g., kamctl) or documentation can still be done as well as getting the new modules in 5.1 in good shape, plus adding exports to kemi interface (which should not interfere with old code). The entire testing phase is expected to be 4 to 6 weeks, then the release of v5.1.0 – likely by end of November should be out.